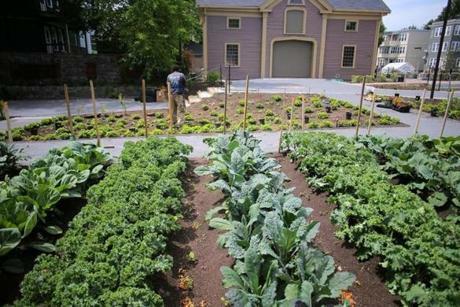 Crops now grow again outside the recently restored, 18th-century Fowler Clark Epstein Farm in Mattapan. The 18th-century farmhouse at the corner of Norfolk and Hosmer streets had been falling apart for years. The oldest structure in Mattapan and a relic of the neighborhood’s rural roots, its fields and orchards were long ago subsumed by suburbs, then dense urban development. Abandoned when its owner died in 1998, the house was seized by the city in 2013, and an array of nonprofits led by Historic Boston Inc. undertook an ambitious $3.7 million restoration. 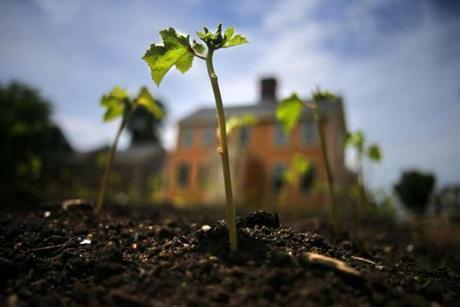 Now, for the first time since the 1940s, berries, tomatoes, and greens are sprouting around the bright yellow farmhouse. The Fowler Clark Epstein Farm is poised to serve as a hub of urban agriculture in the city, and the site of a new weekly farmstand during the summer months. 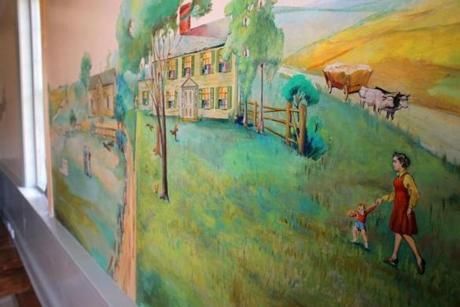 A mural on an interior wall of the farm house. A festive crowd gathered on Monday to celebrate the completed renovations with music, farm-to-table food trucks, and speeches by local politicians. Kathy Kottaridis, executive director of Historic Boston, said she’s proud the site will be a working part of the Mattapan community. Rows of crops grew outside the barn. 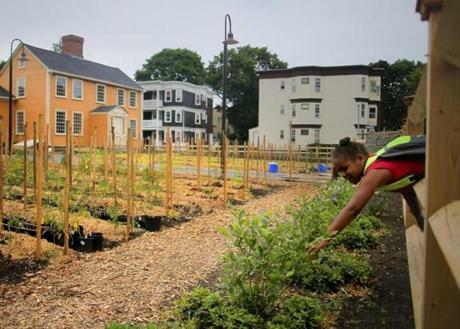 The farming institute, which partnered with Historic Boston, the city, the Trust for Public Land, and the North Bennet Street School to revamp the property, plans to use the site as both a working farm and training center for future urban farmers. In addition to growing food — which it will sell to restaurants such as Mei Mei, Dudley Cafe, and Area Four — the farming institute, previously based on Linwood Street in Roxbury, selects about 10 candidates for a 20-week intensive course that covers planting, technical assistance, and business training. Neighbor Sydani Dennis, 6, sneaked a blueberry through the fence. Spence said the institute will also host a farmstand every Friday from 3 p.m. to 7 p.m. from July to October. “That folks can walk right around the corner for fresh food will be outstanding,” said state Representative Russell Holmes. Part of the new space includes a modern kitchen on the barn’s first floor that will house cooking classes. The farming institute also plans to host a movie night and a seminar for people interested in becoming beekeepers. Crops grew outside the house. The half-acre property, which includes a two-story barn, is surrounded by rows of kale, okra, peppers, and other crops; strawberries and blueberries line the property’s edge. Spence said the institute hopes to install a greenhouse for year-round growing. 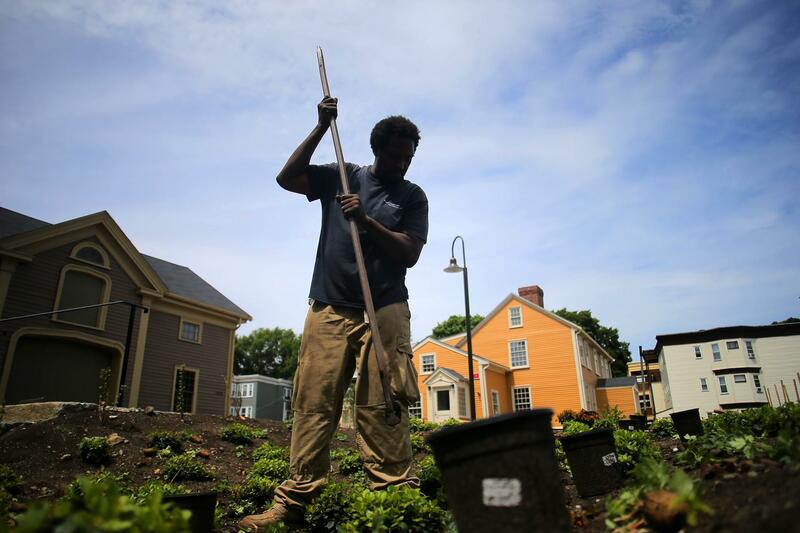 Vivien Morris, who has lived in Mattapan for 30 years and is chairwoman of the Mattapan Food and Fitness Coalition, said the restored farm will be a great boon to the area by improving access to fresh food. Another dividend of the renovation is safety; neighbors say they have already noticed a decrease in illegal activity on the once-abandoned corner. The journey to restore the farm was an arduous one. 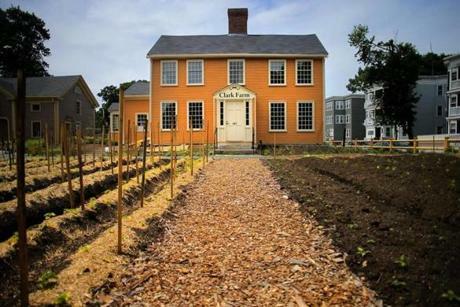 The 18th century Fowler Clark Epstein Farm has recently been restored and the property will now be used by the Urban Farming Institute. The farmhouse was built sometime between 1786 and 1806 by Samuel Fowler, a Dorchester yeoman, on a 330-acre plot. The Clark family took over the property in 1837 and constructed the barn around 1860. As the region developed from agricultural land to a streetcar suburb of Boston, the Clark family gradually sold off its holdings, parcel by parcel, selling the last acre to Jorge Epstein in 1941. At that point, farming at the property ceased; Epstein was an antiques dealer who owned a shop on Blue Hill Avenue. In 2015, Historic Boston bought the farm and the restoration project, funded by donations, loans, and historic tax credits, began in earnest. Renovators from the North Bennet Street School, which teaches traditional trades and often revamps historic buildings, preserved the brick fireplace and beehive oven from the Fowler period. The front windows were restored to their original size and shape after preservationists discovered they were once much larger than the 20th-century reproductions. The barn door, built around 1860, still bears the name “H. Clark.” In what is now the institute’s administrative headquarters upstairs, a section of the original barn stands. Epstein, a prodigious scavenger, incorporated items he salvaged from historic Boston landmarks into the property. Kottaridis said slabs from South Station form a walkway to the house. In the back wall of the house, Epstein embedded a dog-head relief that may have worked as a fountain.